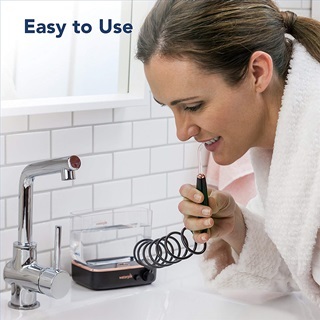 There’s no doubt that Waterpik manufactures some of the most hi-functional water flossers in the world. I’m not just talking about fancy features here. Their products are reliable, durable and most of all, they have something to offer to every budget-group. They have a great collection of both countertop and portable, handheld flossers. 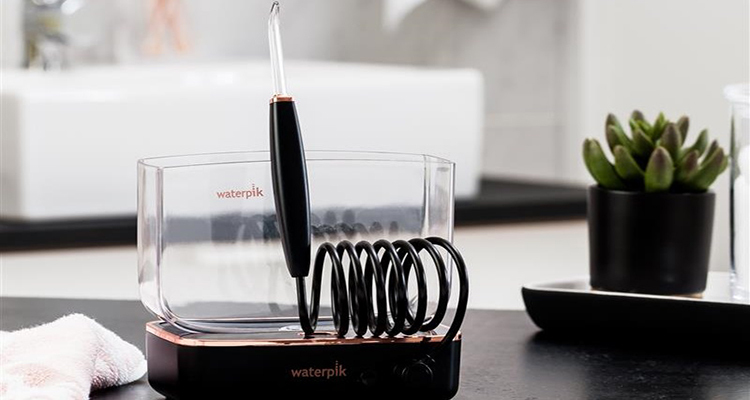 Waterpik WF-04 Sidekick Water Flosser is technically a countertop model. But you can also carry it with you wherever you go. So you are getting the benefit of both. Is it as feature-packed as other traditional flosser models? No. But it is still good enough to complete your day-to-day oral care regimen. It has a space-saving collapsible design, offers 5 pressure settings, operates on a 13-ounce reservoir and is also global voltage compatible. Sounds awesome in theory, right? But do all these features ensure complete teeth and gum cleaning? 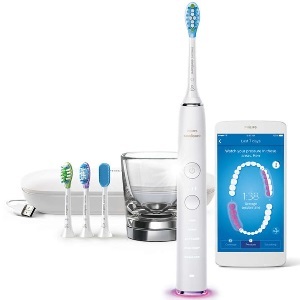 Does it remove the plaque and bacteria brushing can’t remove? Let’s find out. Before I start examining the features, we should take a quick glance at the features of Waterpik WF-04 Sidekick. 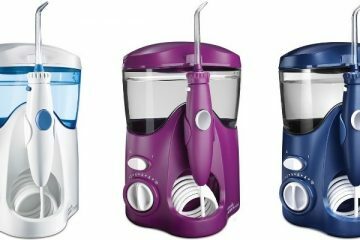 What Makes Waterpik Sidekick Water Flosser Different? 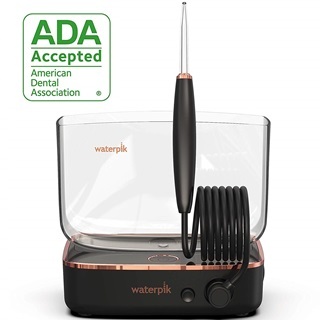 Is Waterpik Sidekick Water Flosser Worth Buying? Size 3.9 x 4.8 x 5.7 "
Uses a fluid container of 13 oz. (400 ml.) capacity. Available in 3 chore accents – Black and copper, white and rose gold and plain white with chrome accents. Includes 1 Classic Jet flosser tip. Pressure range between 10-100 PSI. American Dental Association (ADA) approved. The base unit with a water reservoir. A flossing stylus with tip. WF-04 is undoubtedly one of the most stylish and elegant-looking water flossers by the brand so far. It has a unique collapsible design which makes it easy to pack in carry-on bags. Its ergonomics are similar to that of a regular countertop model. A valve mounted on the reservoir helps to push the water to the pump. The pump then releases the water (at you desired pressure) through the nozzle. For a thorough cleansing of the gaps between your teeth and gum line, it combines both water pressure and pulsation. This is why it works much better than water piks that only use water pressure for removing dirt. The powerful punch of 1400 pulsations per minute and pressurized water flushes out food particles, debris, plaque and bacteria from every corner of your mouth. The 13 ounces reservoir capacity is larger than what most portable flossers offer. You might have to refill the container once or twice to complete your flossing routine. This shouldn’t be a problem as you’ll probably use it in your bathroom, near the sink. Plus, it does not have any lid which makes refilling easier. Sidekick allows you to adjust the pressure settings according to your liking. There are 5 settings to choose from, ranging from 10-100 PSI. Since my mouth is full of dental implants, I mostly choose the 10 PSI setting. It beautifully dislodges food bits from the implants and gives a sweet massaging sensation to my gums. The high-pressure modes are intense and can easily dislodge those stubborn pieces of meat, popcorn, and candy from the tiny gaps between your teeth. I have used a battery-operated flosser before. Trust me when I say that this model is much more powerful and stable than battery-powered, handheld models. Yes, rechargeable batteries are very convenient while traveling but you’ll also have to worry about charging them from time to time. 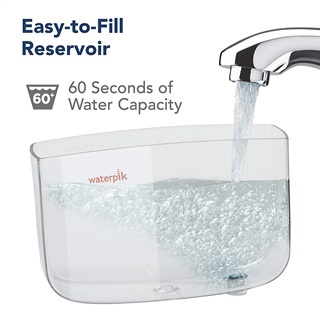 There’s no such hassle to deal with Waterpik Sidekick. Just plug it in, fill the tank with warm water, switch it on and get started. I used to get my teeth and implants professionally cleaned in every 4 months. Now I visit the dentist every 6 months. He himself admitted that my teeth and gum appear to be in a much better condition now. He couldn’t believe when I said that I use an oral irrigator instead of string floss. I also like the fact that it doesn’t create a mess around the sink. I always keep my mouth slightly close to the tip to avoid splashing. There’s only one tip hard-wired in the flossing stylus. It works just like it is supposed to. Honestly, I don’t miss a bunch of free flossing tips since I use this alone at home and while traveling. Another reason why I bought this product was the global voltage compatibility. Always carry a universal plug adapter with you and use it anywhere in the world. Be assured that it works because WF-04 has gone through many clinical trials like all Waterpik models. It is backed by the American Dental Association (ADA). You may not believe everything I say but you can trust the ADA, at least. 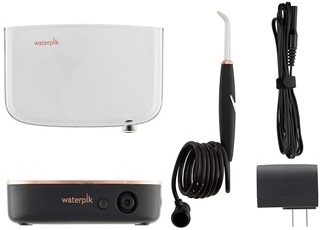 By looking at only the packaging, I could tell that Waterpik has invested a lot of time in the appearance of the product. I was right. Upon unboxing, I found a white base unit with chrome satin finish that looks and feels premium. 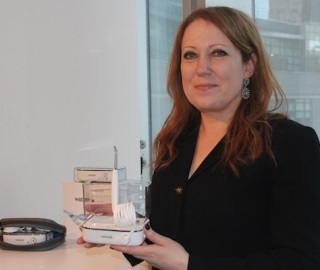 The unit neither as small as most portable flossers nor as large as countertop devices. The size is just perfect to carry along to my long trips. The body is chiefly made from high-quality plastic. Right at the center of the base, you will find a large power button. There’s also a hose release button on the front which could be mistaken for the power button at first. You will also find a hole at the front where you’ll store the flossing stylus when not in use. The pressure slider is situated on the right side. It is not like regular dials that lock into one position. This means you can rotate the dial even between the dots, thus having full control over the pressure output. The compactness of the device comes from its collapsible design. Once you are done with flossing, slide the entire unit including the power supply inside the reservoir and tuck into your bag. Easy! To further enhance the portability, this device allows you to detach the power adapter from the base unit. In this model, the reservoir is not just a simple fluid container. A separate storage for all the electrical parts is tucked into this container. You can even use it as a protective cap by sliding the base into it, thus saving more space on your bathroom countertop. It has a capacity of 13 oz. which is not huge compared to other countertop flossers. But the tank size had to be reduced to make the model compact and travel-friendly. At low-medium pressure settings, you won’t even have to refill it. The 60-seconds of usage time is enough for your day-to-day oral care routine. However, there are a few minor issues with the reservoir. First of all, it doesn’t have a lid. If you are planning to keep in in your bathroom, the open tank might attract dirt and contaminants from the air. Also, there are no measuring marks on the tank’s body. This might be a problem for individuals who need to pour oral medication in the water for flossing. It offers 5 pressure settings while most portable models only offer 2-3. However, 5 settings are still nothing compared to traditional Waterpik countertop models. Before you frown, ask yourself whether you’ll really need 8-9 pressure settings for day-to-day use. Moreover, the way its pressure dial is designed, you can actually customize the pressure output to anywhere between 10-100 PSI. The highest pressure setting is still higher than many handheld, battery-powered flossers. If we put all these into perspective, it becomes quite clear that WF-04 offers the benefits of both countertop and handheld water flossers. While the high-pressure modes are best for flushing out stubborn food particles stuck in your teeth, low to medium settings are ideal for cleaning around the braces, crowns, sensitive teeth and gums. The stylus and jet flossing tip are combined into one unit. The tip is non-detachable and therefore, only suitable for a single user. I don’t think any replacement tip is available if the tip gets broken by accident. In case of such accidents or theft, you will have to buy a replacement stylus, instead of just one tip. 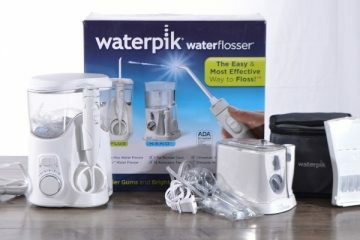 If you are looking for a stationary flosser for your family or multiple users, there are many other options by Waterpik. If you will be the only person to use it, there isn’t much to worry about. The stylus-tip unit is quite robust and won’t break easily. It is designed with a 360-degree swiveling handle which lets you easily adjust the angle of the tip. Once you’re done flossing, detach the cord from the stylus and clip it on to the water reservoir. You just have to press the eject button on the unit to release the cord. During travel, tuck the stylus in the premium travel case included in the box to keep it safe. There’s no button on the handle to stop the water stream. You’ll have to do that using the power button on the base unit. The classic jet tip is well-designed. You can easily clean around the braces, crowns, veneers and dental implants with it. It also narrow enough to penetrate into periodontal pockets. It comes with a US 2 pin power adapter which supports 110-240v. If you are traveling outside North America, you only need to carry a plug adapter with you. There’s no need for a voltage converter. Although you will be able to hear a little pumping sound while using the machine, it is still quieter than most tabletop flossers. It sounds similar to the electric toothbrush I use. Be assured that you won’t be waking up your family while flossing. The fact that the tip and stylus are one piece can be problematic for many. Not an issue for me since I am the only one to use it. Also, it would have been really great to have a lid on the reservoir for hygienic reasons. I don’t really like watching the water in the tank attracting contaminants from the environment. If you are looking for a powerful yet portable solution for interdental cleaning, then Sidekick definitely could be a great choice, especially for the beginners. There’s nothing majorly wrong with it. The tank size is larger than most portable models, you can tweak the pressure anywhere between 10-100 PSI, it provides global voltage compatibility and looks gorgeous too. It is certainly not the best money can buy. But if you want to get the benefits of both countertop and handheld water piks, your search is probably over here. Collapsible design for the ease of traveling. Great tank capacity compared to portable models. Elegant design and available in 3 color combinations. The stylus comes with a swiveling handle. No lid on the reservoir. Good looks, great features, and excellent performance – this is a very rare combination. 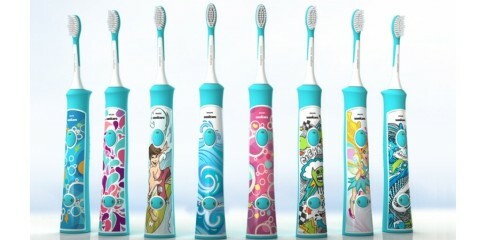 The Waterpik Sidekick Water Flosser provides all of these. I love how it blurs the lines between traditional flossers and modern compact water flossers. The best features of both types are rolled into WF-04. Those who travel overseas a lot or go for long vacations can easily carry this dental care solution with them.